Watch the 2016 New Year's Eve Ball Drop live stream video here and join the whole world in welcoming the new year with a colorful celebration! There will be performances by Daya (Sit Still Look Pretty, Hide Away, and Empire State of Mind), Wiz Khalifa with Charlie Puth (See You Again), Jessie J (Price Tag, Domino, Bang Bang, Masterpiece and Imagine), Demi Lovato (Cool For The Summer and Confident), CNCO of the hit reality show La Banda, Luke Bryan (Move and That's My Kinda Night), Maluma (Borro Cassette and Carnaval), and Carrie Underwood (Smoke Break, Heartbeat and Before He Cheats). The sixty-second countdown starts at 11:59 in the evening. New York City Mayor Bill de Blasio and a Times Square 2016 Special Guest will push the Waterford crystal button that signals the descent of the New Year's Eve Ball. The lighted Ball descends 70 feet in sixty seconds. The Ball is a geodesic sphere, twelve feet in diameter, weighing 11,875 pounds. The Ball is covered with 2,688 Waterford crystal triangles and lit by 32,256 Philips Luxeon Rebel LEDs. As midnight strikes, the lights on the New Year’s Eve Ball are turned off as the numerals of the New Year "2016" burst to life shining high above Times Square. 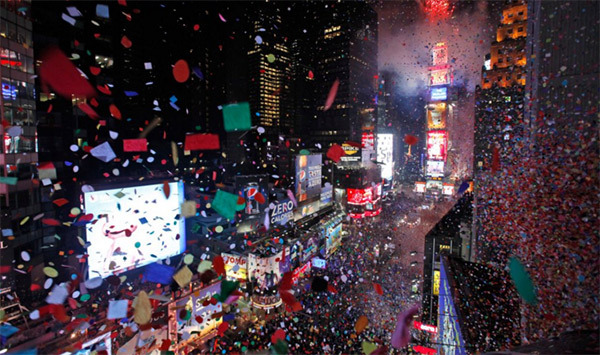 Confetti will be released from the rooftops of buildings throughout Times Square, creating a celebratory blizzard of colorful confetti as revelers welcome the New Year accompanied by colorful pyrotechnic effects.